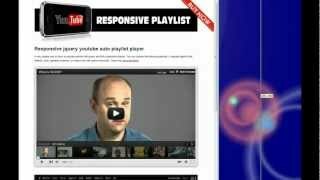 A very simple way to show a youtube playlist with jquery and fully responsive player. You can choose the following playlists. A regulair playlist (the default), user_uploads (channel), or make a list with search keywords. Works on a Iphone. Just add a very small js ,css file and an empty div with an ID or class to your template and fill in a few variables in the $(document).ready(function() and youre done.